Objective: To analyse the impact of infliximab treatment on the number of hospital inpatient days and days of sick leave in patients with active ankylosing spondylitis (AS). Methods: The data of a 2 year open extension study of a 12 week, double blind, randomised, placebo controlled trial, in which all patients with AS were treated with 5 mg/kg infliximab, were used to investigate the effect of anti-TNF treatment on admissions to hospital and days of sick leave. All patients were interviewed at baseline and at regular intervals during the study to collect this information by questionnaires. Patients who completed 2 years of treatment (n = 49) and those who did not (n = 20) were analysed separately. Sick leave analysis was restricted to currently employed patients (n = 38). Results: During the 12 months before the screening visit, 20/49 (41%) completers had been admitted to hospital. After 1 and 2 years of treatment this percentage was reduced to 5/49 (10%; p<0.01), corresponding to a significant decrease in the mean number of inpatient days: from 11.1 to 0.6 after 1 year (p<0.01) and 2.9 after 2 years (p<0.01), respectively. No changes were seen in the dropout group. Conclusion: The use of infliximab in patients with active AS reduces some important costs of AS, but additional studies with detailed cost calculations are needed. Recently we have shown that treatment with the anti-tumour necrosis factor α (TNFα) antibody infliximab is very effective compared with placebo and is effective over a treatment period of 2 years in patients with AS.6–8 Treatment with anti-TNFα agents is expensive. Therefore, it is interesting to know, which reductions in direct or indirect costs could be achieved by this treatment. In this paper we report data on the impact of infliximab on days of sick leave and days in hospital during 2 years. Fifty four patients completed the first year of follow up and 49 the second year. Twenty patients discontinued because of adverse events (n = 14), non-response (n = 2), or other reasons. The patients who were withdrawn or who dropped out had a comparable disease activity to that at baseline as the completers, but at their last visit they had on average a higher BASDAI7 (difference 1.7, p<0.05) than the patients who completed the trial. The completers and dropouts were analysed separately (fig 1) because different results and, especially, clearly different economic consequences were expected. Completers and dropouts of the trial. At the screening visit (<14 days before the first infusion) the patients were asked if they had been admitted to hospital during the past 12 months, and if they had been on sick leave during the past 12 months. During the follow up the same questions were asked every 3 months for the previous 3 month period. The case report forms were continuously verified against the source data by qualified monitors. As the sick leave question was asked only of patients who were employed, this analysis was restricted to these cases. Missing sick leave data of a patient who dropped out were estimated by the mean sick leave days during the observed period for that patient. Complete data were available on admissions to hospital. There are sound reasons to assume that days in hospital and, very probably, days of sick leave were completely reported as the patients were seen every 6 weeks and the study was monitored externally. Preliminary estimates of cost savings were computed on the basis of cost calculations recently made for Germany (€300/inpatient day in an acute hospital, €89 loss of productivity costs for each day of sick leave9,10). Comparisons between the periods before and after the start of treatment with infliximab were made by McNemar’s test (categorical data) or by Wilcoxon’s rank sum test. A powerful sum test recently proposed11 was used to compare the dropouts at their last visit with the completers. Within the 12 months before the start of the trial, 20/49 (41%) patients had been admitted to hospital. After 1 and 2 years of treatment with infliximab the percentage of patients admitted to hospital was significantly reduced to 5/49 (10%) (table 1). This corresponded to a reduction in the mean inpatient days from 11.1 days before infliximab to 0.6 or 2.9 days after 1 or 2 years of treatment, respectively (table 1). From the results, the derived cost savings were about €3200/patient treated for the first and about €2500 for the second year, respectively. Small and non-significant changes in the mean inpatient days were seen in the dropout group, corresponding with cost savings of about €600/patient. However, in the total group a significant reduction in the frequency of admissions to hospital and the mean inpatient days was also found for the first year (table 1). In the completer group a significant reduction in the frequency of sick leave from 57% to 36% of all employed patients and a reduction in the mean number of days of sick leave for each patient from 31.3 to 12.5 were found at year 1. In the second year of treatment the percentage of patients on sick leave was reduced further to 14%. This was significantly different compared with baseline as well as with the first year. The mean days of sick leave also went down significantly to, on average, 4.7 days for each patient (table 1). This corresponded with cost savings for sick leave of about €1700 for the first and €2400 for the second year, respectively. Therefore, cost savings for admissions to hospital and sick leave add up to a total amount of approximately €4900 for each treated patient a year. Again, no significant changes were found in the group of patients who discontinued treatment, whereas for the total sample at least a significant reduction in the mean days of sick leave was found for the first year (table 1). There is an increasing need for socioeconomic analyses and cost effectiveness calculations to achieve a better and more global understanding of the situation of patients who are considered for long term treatment with TNF blockers. Because our group has experience with both short and long term treatment with TNF blockers,6,7 we were able to analyse, in this study for the first time, the reduction of sick leave and days in hospital, which contribute substantially to the direct and indirect costs in patients with AS. Because the completers are the patients with the highest costs of treatment we concentrated our attention on these patients who tolerated the treatment well and completed 102 weeks. In this group half of the patients had been on sick leave (a mean of 31 days of sick leave for each patient treated) in the year before the start of the study. This rate, as well as the rate of admission to hospital of 40% within the year before treatment, was considerably decreased during 2 years of treatment with infliximab. No reduction in the days in hospital or sick leave days was found among the dropouts, but for the total group a decrease in these measures was seen. The data at baseline before treatment with infliximab are consistent with cross sectional data from other studies.2–5 Nevertheless, one may argue that the clear reduction found in the rate of admission to hospital is due to the rather high rate of admission before treatment with infliximab in our patients. This is true, but also in future, patients treated with infliximab will be a selective sample of patients with AS with highly active disease and probably with a higher risk of admission to hospital than patients with AS, in general. Therefore, cost effectiveness investigations are especially needed for this subgroup of patients. Although the number of patients included in this trial was relatively small, the significant reduction of admission to hospital and days of sick leave clearly point to a large potential for cost savings in patients with AS who are continuously treated with this biological agent, infliximab. Socioeconomic analyses, including complete direct and indirect costs and the gain in quality of life, are under way to investigate further the cost effectiveness of anti-TNF treatment. We thank the following rheumatologists for including patients: R Alten (Schlosspark-Clinic Berlin), GR Burmester (Charité, University Hospital Berlin), E Gromnica-Ihle (Rheumtology Clinic Berlin-Buch), H Kellner (University Munich), M Schneider (University Düsseldorf), H Sörensen (Immanuel Hospital Berlin), and H Zeidler (Medical University Hannover). Sieper J , Braun J, Rudwaleit M, Boonen A, Zink A. Ankylosing spondylitis: an overview. Ann Rheum Dis2002;61 (suppl III) :iii8–18. Zink A , Braun J, Listing J, Wollenhaupt J. Disability and handicap in rheumatoid arthritis and ankylosing spondylitis—results from the German rheumatological database. J Rheumatol2000;27:613–22. 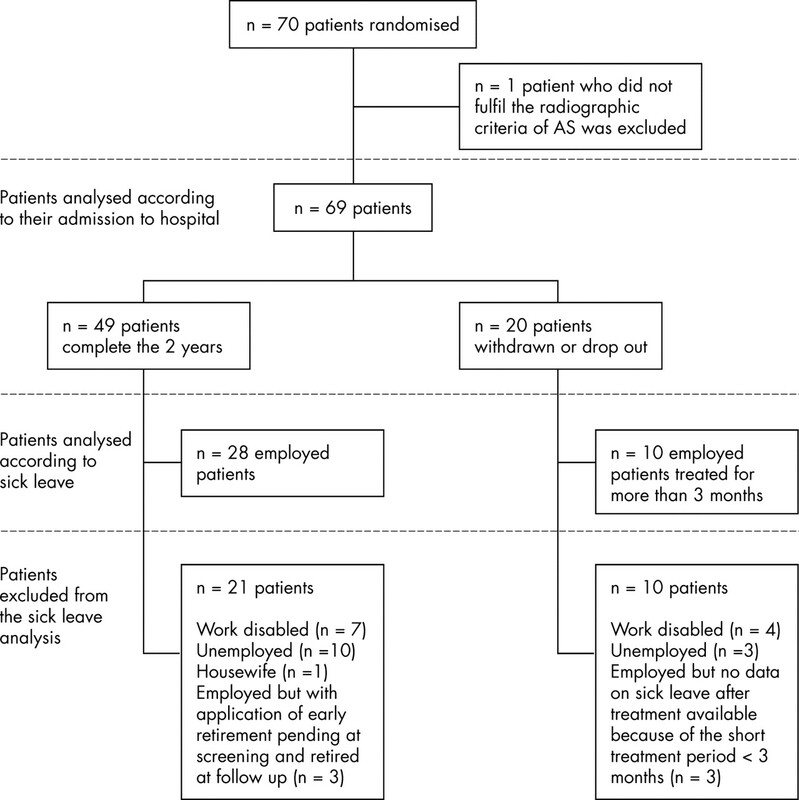 Boonen A , Chorus A, Miedema H, van der Heijde D, van der Tempel H, van der Linden S. Employment, work disability, and work days lost in patients with ankylosing spondylitis: a cross sectional study of Dutch patients. Ann Rheum Dis2001;60:353–8. Boonen A , van der Heijde D, Landewe R, Spoorenberg A, Schouten H, Rutten-Van Molken M, et al. Work status and productivity costs due to ankylosing spondylitis: comparison of three European countries. Ann Rheum Dis2002;61:429–37. Braun J , Brandt J, Listing J, Zink A, Alten R, Burmester G, et al. Long-term efficacy and safety of infliximab in the treatment of ankylosing spondylitis. An open, observational, extension study of a three-month, randomized, placebo-controlled trial. Arthritis Rheum2003;48:2224–33. Brandt J , Listing J, Alten R, Burmester R, Gromnica-Ihle E, Kellner H, et al. Two year follow up results of a controlled trial of the anti-TNFα antibody infliximab in active ankylosing spondylitis. Arthritis Rheum2003;48 (suppl) :S172–3. Minden K , Niewerth M, Listing J, Biedermann T, Schöntube M, Zink A. Burden and cost of illness in patients with juvenile idiopathic arthritis. Ann Rheum Dis2003;63:836–42. Anonymous. Deutsche Krankenhausgesellschaft: Eckdaten der Krankenhaus-kostenstatistik 2001/2000. (German Society of Medical Hospitals: Statistic of the costs of hospital stays,). http://www.dkgev.de/pub/newpdf/pdf-2003/RS93-03_Anlage1-Krankenhausstatistik2001.doc.pdf. Listing J , Schlittgen R. A nonparametric test for random dropouts. Biom J2003;45:113–27.